2016 is here, and it’s safe to say that the hype around social media has well and truly settled. We have watched social charge through its wild, carefree teenage years and make billions of friends in the process. Undeniably the popular kid at school, the period of freedom has now come to an end. It’s time to settle down, get a real job, and pay back mum and dad some of the money it owes. With social media platforms as a whole reaching a stage of maturity, it begs the question: Why are so many B2B companies still not making the most of social? Though there are a number of stellar examples of B2B brands who have implemented a comprehensive social strategy, the vast majority of them remain conspicuously absent. Perhaps they’re unconvinced of the value, or they’re unsure of how exactly to implement it, or potentially even a little scared? No matter the reason, it’s time for B2Bs to address some limiting beliefs. And that begins with the terminology. The term “social media” comes with a whole suite of preconceived ideas. It is hard to separate the term from key platforms such as Facebook, Instagram, LinkedIn, or Twitter, and though these platforms are undeniably big players, social should not be defined solely by the platforms that comprise it. At its core, social is a mindset, a concept, and an approach. It is an idea on which platforms were founded and on which new ones will be developed. But it is more than the platforms. It is the expression of its fundamental idea: to open up communication, collaboration, and the sharing of information across networks of people. From this broader perspective, we move beyond simply thinking how a B2B should manage their Facebook page toward considering how social tech could benefit a business as a whole. Enterprise Social Networks (ESNs), for example, can dramatically improve communication flows within an organization and lead to all kinds of benefits that go well beyond the traditional view of what social media does. These kinds of technologies have real benefits with a tangible impact on the bottom line. In fact, after the Polaris Group company Intellect Design Arena introduced their ESN, they reported saving a staggering 1.3 million man hours per year simply through reducing unnecessary emails. That is a serious increase in efficiency with an equally serious impact on the bottom line. By implementing an ESN, they managed to break down silos, open up communication, and reap some real rewards. This is a great example of how taking a broader perspective of social can open doors for B2B companies. For this reason, we encourage B2Bs to adopt the broader term of social technologies. This small shift in terminology can lead to a big change in perspective. With all that said, the reality is that the aforementioned social media platforms are the dominant ones, and there are many ways in which they can help B2B companies achieve their goals. 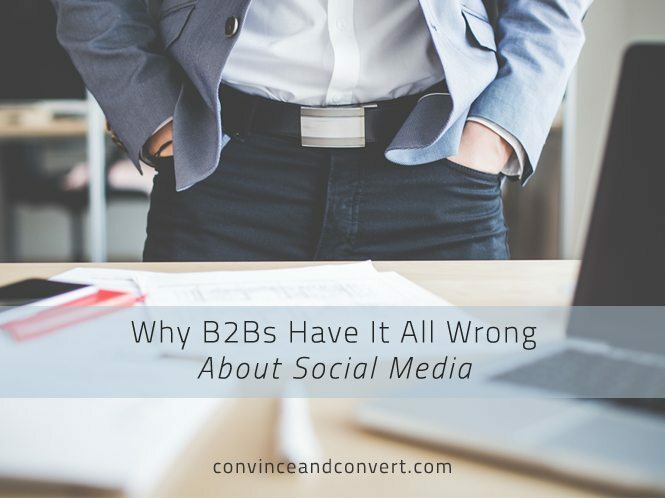 But first we must overcome a common hurdle: Most B2B companies don’t understand specifically how social media could help their business. With most information and discussions on social media strategy focused on using social to engage directly with your target market—a key advantage for B2Cs—the use case for B2Bs isn’t immediately so clear cut. LinkedIn, however, has proven to be enormously effective for B2B selling and played a key role in what is referred to as social selling. As the stages of the sales process and how sales reps work begin to evolve, LinkedIn provides an excellent way for sales reps to prospect, research, and engage with leads. But with the exception of LinkedIn, for the most part, the direct to consumer nature of the other major platforms poses a tricky question for B2Bs. How could an industrial machinery parts company possibly benefit from a Facebook page? Why would a business bathroom supplies company create YouTube videos? These are legitimate questions with surprisingly compelling answers. In Orca Social’s latest eBook, “10 Reasons B2B Companies Need Social Media,” we share a number of case studies that answer the above questions and more. 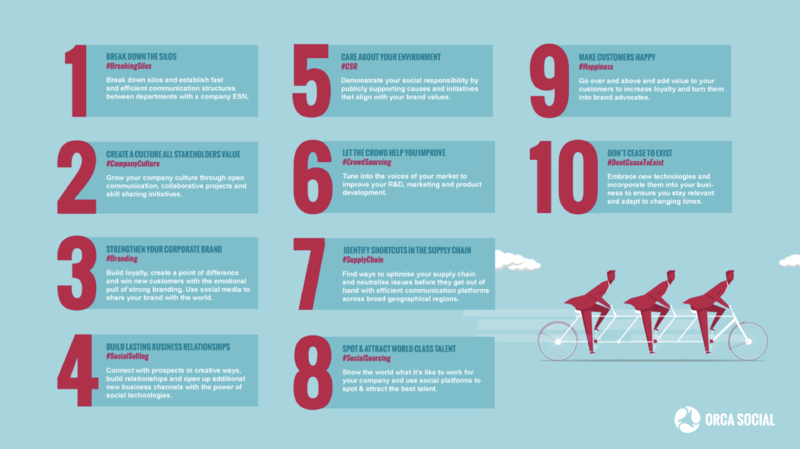 Our aim is to reframe the context of social for B2Bs by outlining 10 compelling reasons to make social technologies a key part of their digital strategy. As Steven Denning wrote in Forbes magazine, the average life expectancy in 1955 of a firm in the Fortune 500 was around 75 years. Today, it’s only 15 and getting smaller each year. One thing is clear: The world is moving faster and faster, and those who fail to adapt to the changes won’t survive. With social technologies becoming more and more commonplace, continuing to turn a blind eye to what is becoming such an integral part of the way the world communicates will end badly. As 2015 comes to a close, it’s time for B2B companies to finally take the plunge and make social a key part of their digital strategy. If you are still not convinced, or would like to know more, you can download the “10 Reasons B2B Companies Need Social Media” ebook at bit.ly/orca-ebook.